CI readership of about 9000 includes IUPAC members and affiliates, and individual subscribers. 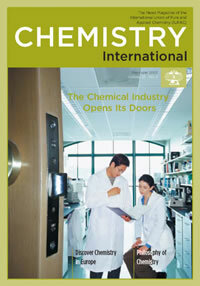 While 3000 copies are distributed in the United States, the rest go around the world, including all the countries that are adhering organizations of IUPAC, e.g., Argentina, Brazil, Canada, Belgium, Norway, South Africa, India and New Zealandjust to cite a few among the more than 60 countries that receive CI. Interested in writing a feature article, contact the editor, Fabienne Meyers, at <fabienne@iupac.org>. Page last modified 2 May 2003.